Why Do Some Credit Cards Offer an Interest-Free Period? It’s no secret that credit card companies are in the business of making money. One way they do this is by charging interest on customers’ unpaid balances. This is why many people are confused when credit card companies offer cards with an introductory interest-free period on purchases and/or balance transfers. Why do banks run these promotions, and is it a good idea to take advantage of them? Check out the details below for more information. The primary reason credit card companies offer introductory interest-free periods on some cards is that they’re trying to attract new business. This could come in the form of completely new customers or enticing existing customers to open an additional card. But why do credit card companies want new business from people they know won’t be paying interest for an extended period of time? The answer is twofold: For one thing, charging interest isn’t the only way credit card issuers make money. They also bring in revenue from fees. Some of these are fees customers pay, such as annual and late fees. But they also include interchange fees that merchants pay when customers swipe their cards. This means that even if cardholders aren’t paying interest, the credit card company is still making good money from its cards being in use. Also, interest-free periods don’t last forever. 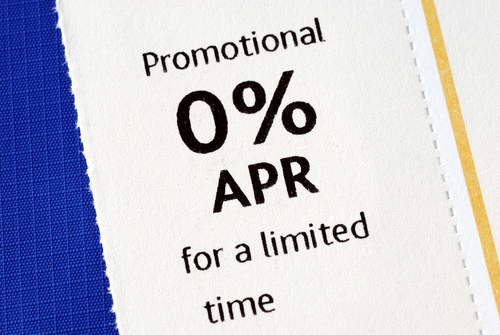 Introductory 0% APR periods are generally in effect for 6 to 21 months. Even if customers aren’t paying interest right away, they might before they know it. This represents an opportunity for credit card companies to profit in the future by reeling in new business with an introductory interest-free period up front. Is it ever a good idea to take advantage? You’re planning to make a large purchase – If you need to make a big purchase and want a few months to pay it off without incurring interest, signing onto a credit card that offers a 0% period might make sense. Just be sure that you pay it off before the interest-free window closes. You have debt on a high-interest card – Doing a balance transfer from a high-interest card onto a 0% APR card is another good reason to take advantage of an interest-free offer. You could save big bucks if you do this carefully. See NerdWallet’s best balance transfer credit cards for the top options. Nerd note: If you have poor credit, you may not qualify for a 0% balance transfer offer. These promotions are usually only available to people with good (or in some cases excellent) credit. If this doesn’t sound like you, consider other strategies for paying off your balance. You’re new to credit and want room for error – Some people who are new to credit get nervous about using it for the first time. If you’re inexperienced with plastic and want to leave yourself room for error in case you overcharge, a card with a temporary 0% APR card might be a good way to get acclimated. How long is the 0% period? Interest-free periods have been getting longer, so look for one that lasts 10-12 months if you have good credit. Does the card charge a balance transfer fee? If so, you might end up paying more in fees than you’ll save in interest. Check out this resource to find a card that charges no balance transfer fee. What’s the APR on the card after the 0% period is over? Ideally, you’ll pay off the charges before interest starts building, but looking for an interest rate of 15% or lower is still a good idea. What types of rewards does the credit card offer? Does the card offer other benefits? For example, does it carry a signup bonus? If the card you’re considering has a long interest-free period and offers other perks like no balance transfer fee or a solid rewards program, it might be worth considering. The takeaway: Credit card companies like to drum up new business by offering limited-time, interest-free periods. In some cases, it might make sense to take advantage of these promotions. Just be sure that you’re signing onto a card that has other good qualities and that you pay off your charges before the interest-free period is up.